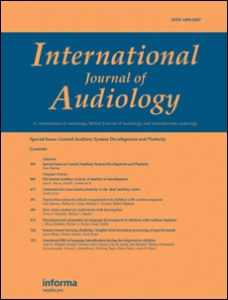 International Journal of Audiology (IJA) - high-quality papers on the science and clinical practice of audiology to a widely circulated readership using thoughtful and efficient peer review process. The International Journal of Audiology is a peer-reviewed academic journal. It is provided free of charge to all BSA members online. The full access includes access to archive copies of the Scandinavian Audiology Journal and the British Journal of Audiology, both of which merged with the International Journal of Audiology in 2001. It is owned the British Society of Audiology, the International Society of Audiology & the Nordic Society of Audiology. BSA Members can go here to gain full access.